This morning I made my annual birthday pilgrimage to Fat Apples for a Baked Apple Pancake along with dear friends and family. 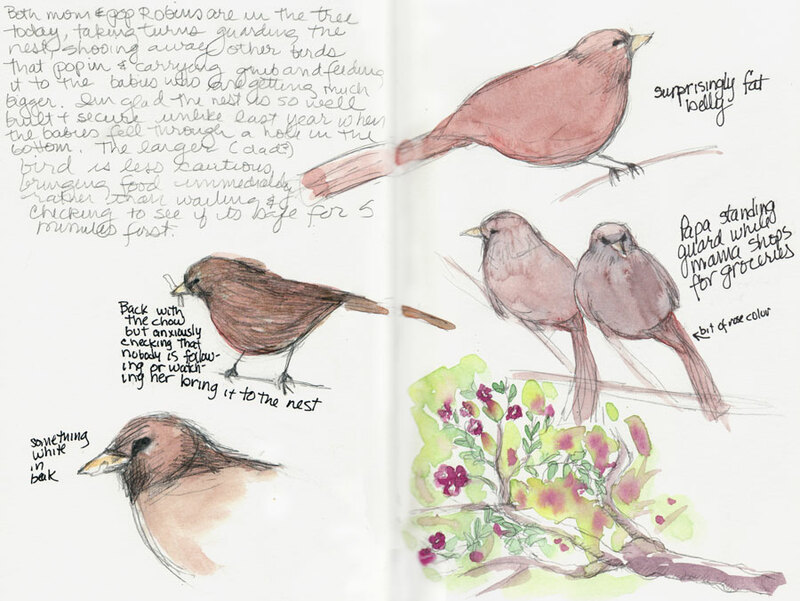 Then I sketched this little family of California Towhees [update: not robins!] who are living in the small tree outside my bedroom window. Mom and Pop Towhee take turns guarding the nest, feeding the babies and shopping for groceries. When one returns with a juicy white worm to feed the babies, the other flies away to gather the next round of grub (literally?). The robins enter the tree from the house side where the branches are more open, which gives me a great view from my bedroom window (except that it’s too shadey in the tree to see their features clearly). My cats sit on the bed and watch the constant activity all day: the best Kittie TV ever. Sometimes I join them and have been amazed how hard these little birds are working to keep their babies fed. This sketch is in the Fabriano 9×6 sketchbook that has been giving me such pleasure when sketching and such pain when scanning. But now I have a solution. I just got the fantastic, super fast, hugely improved new version of Photoshop CS4. After scanning each page of a spread separately, Photoshop will automatically assemble the pages perfectly together as layers/masks in one file, getting rid of the bad stuff, while lining them up perfectly. For other adjustments, Auto Levels does a great job now, better than all the manual tweaking I’ve done in the past. And a bit of the Dodge tool cleans up any remaining shadows. The new streamlined user interface and adjustment panel are huge timesavers and make image adjustments so much easier and faster. It was a bit of a splurge, but at $199 (after the $100 off Adobe offers on on any version of Photoshop CS through August) it was so worth it. A happy birthday to me present! Happy Birdday to you! Birds! What great subjects for drawing or shapes for squishing clay into. I looked up in the tree just above my studioette the other day and saw a bird’s nest with a receipt from the nursery loosely woven into one side. Happy BirdDay and BirthDay to you Jana! That sounds like a perfect way to start the day. Yum! When I went to America I was really surprised to see that the birds you call robins were so different to the little round things we have here that we call robins. Just looked it up and discovered that at least three completely different birds around the world are called robins! Belated happy birthday, dear Jana. I’m so glad you had a happy day—very much deserved, I might add! Lovely little birthies, I mean, birdies.